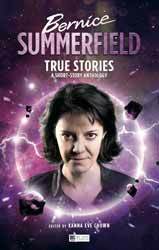 This is the first Bernice Summerfield book from Big Finish since 2014’s Adorable Illusion, though the archaeologist did appear a year later in Big Bang Generation, a Doctor Who novel from BBC Books. The six stories in this anthology are loosely connected by the themes of truth and lies. These subjects are most apparent in editor Xanna Eve Chown’s frame narrative, in which Bernice, who is on trial for reasons that become clear towards the end of the book, is obliged to recount six tales from her recent past – three of them true and three of them false. The first – and longest – of these accounts is Hue and Cry, written by Kate Orman and Q. An intriguing collation of native religious tensions and ancient alien artefacts that resemble China’s Terracotta Army, this story also boasts memorable characters such as a socially awkward but physically agile four-foot reptile called Gilly. With her chameleon-like appearance and electronic voice box, I initially thought that Gilly might be a Foamasi from The Leisure Hive. However, her species’ reputation for theft comes from a primal kleptomaniac urge rather than organised crime as such. In fact, all of the stories in this collection are refreshingly free from continuity references. All you need to know beforehand is that Bernice is exploring a universe that is not her own – as the cover blurb tells you. There are strong narrative connections between Hue and Cry and the next story, Jonathan Blum and Rupert Booth’s Never the Way. This probably has something to do with the fact that Blum and Orman are husband and wife and occasional writing partners. These connections are not revealed until quite some way into the tale, so I shan’t go into specifics. What I can say is that the plot concerns Benny’s efforts to save the life of a young princess who is under threat of assassination. Blum and Booth skilfully balance peril with some sly in-jokes – including a use of the word “intertwangled” of which I’m sure the broadcaster and Radio Times columnist Eddie Mair would approve. Three of the stories in this volume are intertwangled by the topic of time travel, which appears in various forms in Never the Way and the next two entries, Fast Contact by Matthew Griffiths and Futureproof by Victoria CW Simpson. Fast Contact finds Bernice experiencing speed dating – that’s “dating” in both senses of the word, since the archaeologist is trying to uncover certain historical facts while pretending to be merely chatting to potential partners over drinks. However, the professor’s undercover research is not the only layer of subterfuge in this entertaining yarn, which gets progressively more comical as Benny’s inebriation increases. Futureproof is an altogether more sober affair, contrasting the bold environmental claims made by a supposedly ethical corporation regarding the heritage planet HP79 with the grim fate that truly lies ahead. Simpson’s story reminds us that the universe in which Bernice is currently trapped has a somewhat shorter life expectancy than our own. There’s further institutionalised deception in Tim Gambrell’s Stockholm From Home, another light-hearted tale in which Benny accidentally commits herself to a stay at a retirement home, thinking it’s a health spa. There are plenty of amusing moments here, involving blue rinses, a randy insectoid, an ineffectual invader and a frustrating lack of booze. However, our heroine does seem a little slow on the uptake, and some key words of explanation appear to be missing from the text. For example, presumably Bernice uses a teleporter to get aboard the Thub ship, though this is not spelled out. The final story, Bliss, is written by the book’s editor and leads into the courtroom frame narrative. From the outset of this tale, Bernice suspects that the name of the planet Bliss sounds too good to be true. She senses a bit of calculated PR – as well she might, since various false or exaggerated claims are also part and parcel of the previous three stories. The danger that the people of Bliss are sleepwalking, or rather just sleeping, towards is nothing new in science fiction (see also Star Trek’s The Cage and the Matrix trilogy, among others), but Chown’s prose is eminently readable. Yes, it’s been a while since the last Benny book, but it’s good to have her back in print – and that’s the truth.